Home Food and Drink Himachal trout is love! Here’s why it’ll never betray you! Himachal trout is love! Here’s why it’ll never betray you! Trout is one true love of a Himachali. Well, it is at least second to dham, and we just love it! Rainbow trout is famously found in the freshwater of the rivers of Himachal Pradesh. This has also helped in springing up of a number of trout farms all over the state. The locals even fish them privately. Trout is enjoyed by the locals and tourists alike. A lot of politicians even from outside Himachal Pradesh love to dig into trout delicacies when they visit the state. So what is so special about trout that makes us so greedy for it? Trout is a very healthy alternative of protein. Apart from protein, it contains potassium, phosphorous, omega-3 fatty acids, vitamin-B complex and selenium. All these nutrients help the body age better without the risk of heart diseases. They help regulate blood pressure in the body. Bones, metabolism, brain cells, you name it and rainbow trout is ready to shower you with its health benefits. One can either buy raw trout or eat at the adjoining restaurants at these fish farms. Trout can be cooked in a number of ways. You can either fry it, bake it, or make fish curry out of it. Let’s just say, there’s no end to the number of recipes one can come up with while cooking trout. Out of these, pan fried trout is liked the most. The crunchy fried skin with a really soft inside is as delectable as can be. Be Careful of the tiny bones though! There are a lot of restaurants which also serve boneless trout for a little extra charge. Why does trout taste different? Since trout is found in freshwater, it lacks the action of amino acids, usually found in sea water fish. The amino acids add flavour to the sea water fish. However, trout is devoid of such a taste. This makes this fish simple in taste and open to variation in recipes. Though the taste is a little bland, it is still different and liked by all due to its subtle quality. So when we say trout is love, do we need to add any more reasons than the above? We guess not! Trout is not only delicious but also quite healthy, keeping the mountain folks sturdy in all conditions. 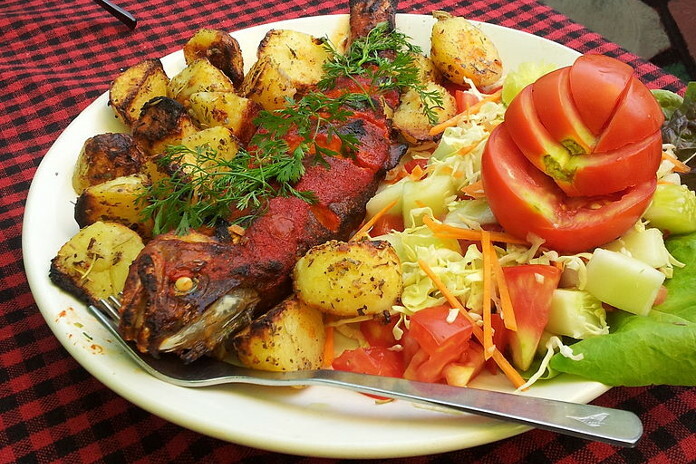 So, when you are in Himachal next time, don’t forget to try out some trout dishes! It looks good on Instagram too! Tishta is a writer and explorer who loves to know about everything in the world. An avid reader and traveller, she can be found looking for constellations in the night sky with a telescope when not lost in the solitude of the mountains, seeking meaning to life and beyond.